Air fresheners can be said to be a staple for most vehicles. After all, cars do tend to get all messed up, especially if you are not too worried about the kind of dirt that your shoes pick up along the way, not to mention when it comes to children and eating in cars, things can get messy real fast, so much so that you might even be able to locate a french fry from a couple of months back under the carpet. 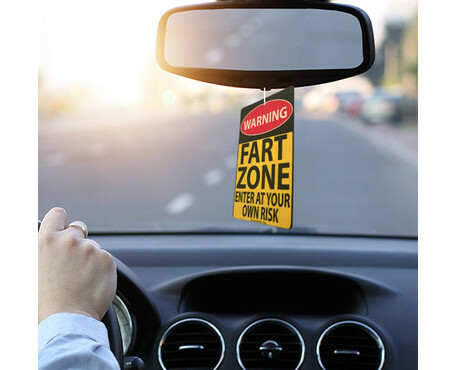 All of these add up when it comes to the smell of the car, and here is a gag air freshener that will surely elicit its fair share of laughs – the $3.99 Fart Zone Air Freshener. I suppose it is fair warning to all your other passengers, especially if you eat plenty of beans each day.